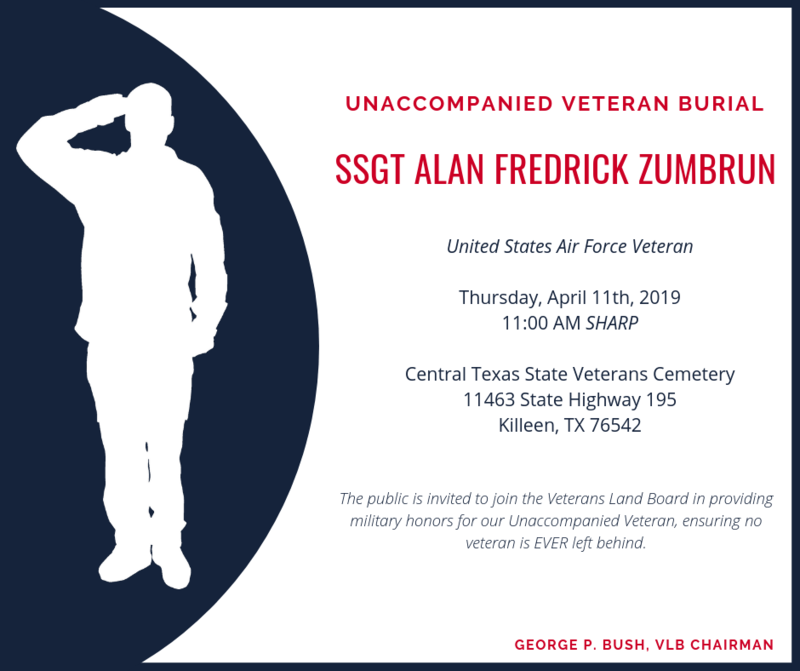 BIG SPRING — Today, Texas Veterans Land Board Chairman George P. Bush announced that on Thursday, April 11th, 2019 at 11:00 a.m. SHARP, the Central Texas State Veterans Cemetery in Killeen, Texas will conduct an Unaccompanied Veteran burial for SSGT Alan Fredrick Zumbrun. Born in June of 1944, Zumbrun served in the United States Air Force from 1952 to 1961 and holds the rank, SSGT. Zumbrun has also been awarded the Air Force Longevity Service Award with one oak leaf cluster and the Good Conduct Medal with two bronze loops. Zumbrun is not expected to have anyone attend his funeral as no next of kin are able to attend. Please help us spread the word and ensure that our United States Air Force Veteran is not buried alone. Members of the Central Texas community are welcome to attend. Central Texas State Veterans Cemetery staff has coordinated with the Air Force Casualty Office at Lackland Air Force Base, San Antonio, TX to ensure that Zumbrun will receive full military honors. If no next-of-kin presents themselves at the ceremony, the On-Site Representative of the Veterans Land Board will accept the United States flag on Zumbrun’s behalf. The Texas Veterans Land Board works with the local community and fellow Veterans service organizations to ensure that NO Veteran is EVER left behind. Please join us to honor his life and service with a full military burial. Please consider sharing our social media posts to help notify the community on both Facebook and Twitter. Media is welcome, and we ask that you RSVP so that we can facilitate your coverage of the service. Thank you for your support of our Texas Veterans. Together as a community, we can guarantee that NO Veteran is EVER left behind. While notice times vary, the Texas Veterans Land Board issues an advisory to the community upon notice of an unaccompanied Veteran burial.